"when i was 18 years old, i decided to get a tattoo of a spider on a purple web on my right shoulder. only, it never really looked like a spider on a web. it looked more like a peacock. so, at 26, very sick of people asking me about the wimpy peacock on my shoulder, i went into Monkey Wrench tattoo shop in Santa Rosa, CA and talked to Billy the Pope about my options. he said only two things would do the trick: a panther or a dragon. intrigued more by the dragon option, i asked him to draw up some ideas and o, by the way, can you tattoo these chinese characters for wu wei [from Taoism] on my arm before i go home? and so he did. two weeks later i go back in, and there's my dragon - carefully drawn out on very thin paper. we started work: it took 9 2-hour sessions. Billy was so excited, he was beside himself. he got to do something more creative than the usual rose or sailor. and i got to cover up that ridiculous peacock." kathryn l. pringle lives in Oakland, CA. She is the author of fault tree (winner of Omindawn’s 1st/2nd book prize selected by C.D. Wright), RIGHT NEW BIOLOGY (Heretical Texts/Factory School), The Stills (Duration Press), and Temper and Felicity are Lovers.(TAXT). Poems can be found in Denver Quarterly, Epiphany, Fence, Mrs. Maybe, Phoebe, and fiction can be found in Manor House Quarterly and Horse Less Review. Her work can also be found in the anthologies Conversations at the Wartime Cafe: A Decade of War (WODV Press), I’ll Drown My Book: Conceptual Writing by Women (Les Figues), and The Sonnets: Translating and Rewriting Shakespeare (Nightboat Books). In 2013, she was a very grateful recipient of a gift from the Fund for Poetry. 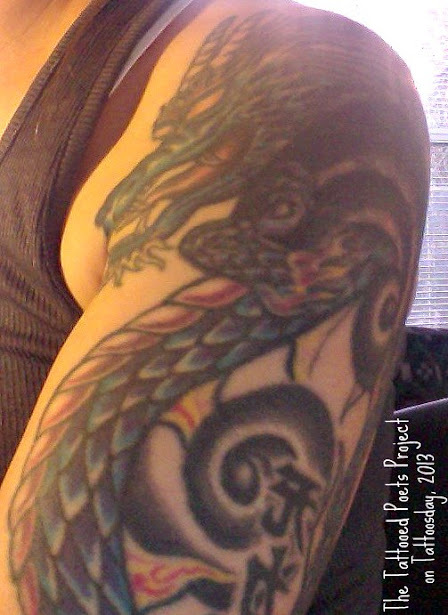 Thanks to kathryn for sharing her poem and tattoo with us here on Tattoosday's Tattooed Poets Project! 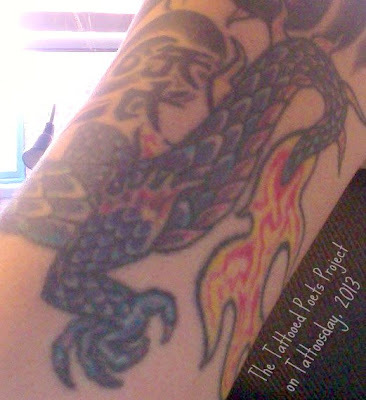 This entry is ©2013 Tattoosday. The poem and tattoo are reprinted with the poet's permission.